Zimbabwe's ruling Zanu-PF party is set to begin impeachment proceedings against President Robert Mugabe on charges that include allowing his wife "to usurp constitutional power". The motion is now due to be presented to parliament on Tuesday. Separately, military leaders said they had planned a "roadmap" for Mugabe's future, and that the ousted former vice-president, Emmerson Mnangagwa, would return to the country soon. 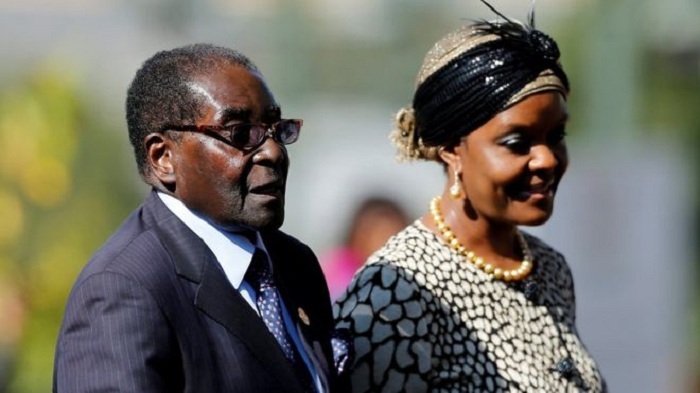 Grace Mugabe and Mnangagwa had both been seen as potential successors to the ageing president. But last week, Mugabe fired his deputy - widely seen as an endorsement of his wife - prompting a military intervention. The country's top general said Mugabe and his former deputy had been in contact, and would hold in-person talks soon. What are the charges against President Mugabe? Zimbabwe's constitution allows for impeachment on grounds of "serious misconduct", "violation" of the constitution or "failure to obey, uphold or defend" it, or "incapacity". "The main charge is that he has allowed his wife to usurp constitutional power when she has no right to run government. But she is insulting civil servants, the vice president, at public rallies. They are denigrating the army - those are the charges," Paul Mangwana said, emerging from a party meeting. "He is of advanced age, that he no longer has the physical capacity to run government," he added. "He is a stubborn man, he can hear the voices of the people, but is refusing to listen." Impeachment proceedings are now expected to be launched on Tuesday, with votes in both the National Assembly and the Senate. Both chambers must then appoint a joint committee to investigate removing the president. If the committee recommends impeachment, the president can then be removed if both houses back it with two-thirds majorities. "We are expecting the motion to be moved tomorrow... and hopefully by Wednesday - because the charges are so clear - we expect that by Wednesday, we should be able to vote in parliament," Mangwana said. The opposition MDC-T party has tried unsuccessfully to impeach Mugabe in the past. But with the support of Mugabe's own Zanu-PF party, which has an overwhelming majority in both houses, the vote is now likely to go against him. If the impeachment goes ahead, the military can claim that he was removed legally, and not by armed force. If that happens, current vice-president Phelekezela Mphoko should assume the role. But Mphoko is a known supporter of Grace Mugabe, and the generals would prefer to install Emmerson Mnangagwa, the former vice-president who was named the new Zanu-PF party chief on Sunday. The crisis began two weeks ago when the 93-year-old leader sacked Mnangagwa, angering army commanders who saw it as an attempt to position his wife as the next president. With Zimbabwe embroiled in a deep economic crisis, the president had already seen some of his support wane. Last week, soldiers seized control of the state broadcaster and placed the president under house arrest - but denied their actions amounted to a military coup. Since then, he has been held at his "blue roof" mansion near the capital. On Sunday, Mugabe gave a televised address which surprised many Zimbabweans because it made no mention of the pressure from his party and the public to quit. Surrounded by generals, he declared that the military had done nothing wrong by seizing power and placing him under house arrest. He then vowed to preside over the Zanu-PF party congress, due in a few weeks. The BBC's Africa editor, Fergal Keane, said his understanding of the situation was that Mugabe had agreed to resign, but then changed his mind. Mugabe is now opposed by his own party as well as the political opposition, the military and the powerful War Veterans Association. The public has also poured on to the streets in protest, calling for the end of Mugabe's 37-year presidency.